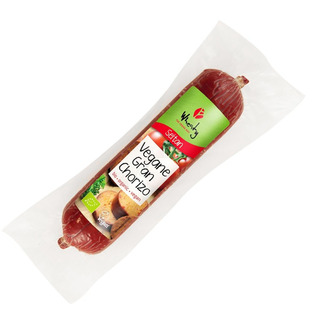 The Gran Chorizo brings Spanish flair into the vegan natural food world: solid, savoury, full-bodied, air-dried! For the first time a vegan product that has been given a salami-starter culture and has been air-dried. Lactose-free, without eggs and super-tasty! Sealed package can be kept unrefridgerated! seitan (water, wheat protein*) 67 %,, red bell pepper*, coconut fat*, spices* (contain cellery* and mustard*), yeast extract*, onions*, salt, thickening agent locust bean gum*, smoke**.